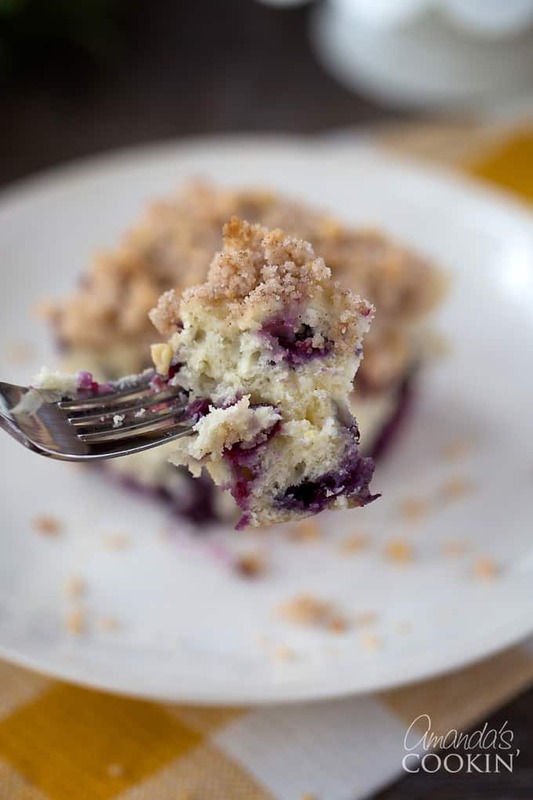 Blueberry breakfast cake, coffee cake, blueberry buckle, whatever you want to call it, it’s overflowing with fresh blueberries and absolutely delicious. As I’ve said before and will always say again, I love having the addition of a little sweet treat to accompany my morning coffee. It’s not an everyday thing, but when I do whip up a cake, roll or bun it makes breakfast seem so much better! It’s like when my kids ask for these gooey, soft homemade cinnamon rolls, it’s now between those and this blueberry breakfast cake I’m getting requests left and right for! If you decide to use cherries, add in a bit of almond extract. If using cranberries, I would add a few fall spices like nutmeg and cinnamon. If you use a tangy fruit like sour cherries or cranberries, you might want to add the glaze for added sweetness. The crumb topping really is enough for this, but you can certainly add a pretty white drizzle on top. Either way, this coffee cake is amazing! There have been a few people that have said this recipe did not work for them. Without being in their kitchen with them, I can’t say specifically what went wrong, but I can definitely offer some suggestions here. 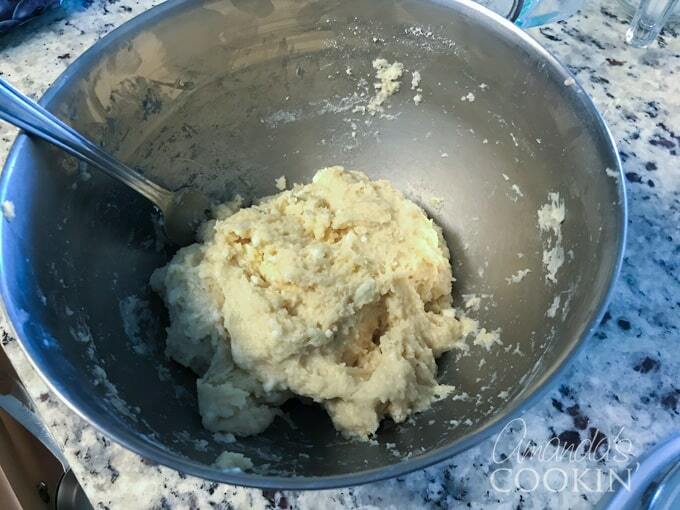 The number of people that have made this recipe with success, including myself on several occasions, far outweighs those that had trouble, so maybe we can pinpoint and address some of the things that may have caused problems. Please do not be tempted to adjust the ingredients. Patience is important here, take your time and mix until done then fold in the blueberries. That may take a little persuasion as well. Softened butter – I think this is a common issue in the kitchen. Softened butter simply means it’s not rock hard from the refrigerator and should be soft enough for your finger to cause a slight indent. Your finger should NOT sink into the butter, that’s too soft. When butter gets too soft, or worse is actually melted, it changes the chemical reaction that takes place when mixed with other ingredients. My suggestion is to remove the butter from the fridge first, then measure out all of your other ingredients, preheat the oven and grease your pan. When you get to the step of adding the butter, cut it into small pieces and mix it in. Use your hands if you need to. Measuring your flour – it’s so important to measure flour properly using the “scoop and sweep” method. Plunging a measuring cup into a bag of flour and lifting it out in one fell swoop will give you more flour than if measuring correctly. In fact, I did a test and found that the difference for one cup of flour was half an ounce. That might not sound like a lot to you, but one properly measured cup of flour weighs approximately 4.5 ounces. Two cups of improperly measured flour will yield an extra 1/4 cup of flour. That’s a considerable amount where baking is concerned, especially with a recipe like this that has such a thick batter already. Scoop and Sweep – Place your measuring cup onto a piece of waxed paper. Stir the flour to aerate it and make it fluffy. “Scoop” flour out with a spoon and drop it into the measuring cup until the cup is overflowing. Use the flat edge of a knife or icing spatula to “sweep” the excess flour off the top leaving a perfectly level cup of flour. This is the scoop and sweep method. By the way, the waxed paper is there to catch the extra flour so you can easily put it back into the bag. If you are still unsure, here’s a quick video and explanation of how to properly measure flour. Glass vs metal pan – The photos in this post show that this cake was baked in a glass dish. The first time I made it I used a metal pan. Both will work, but glass takes longer to heat up, then when it does it gets very hot. Metal pans are more consistent and I think they are much better for baking evenly. That said, I have successfully baked this in a glass pan. I think that covers the questions that people have had. If you have any others, please leave them in the comments so I can address them! For glaze, combine the powdered sugar and milk. If too thick, add a few drops of additional milk at a time until it reaches drizzling consistency. Drizzles over the top of the cake and allow to sit until sugar solidifies. Preheat the oven to 350 F and spray or grease a 9-inch square baking pan. In a large bowl, whisk together flour, sugar and baking powder. Cut butter into small pieces. Add egg, milk, butter and lemon peel; mix just until dry ingredients are moistened. You may need to finish mixing with your hands to get all the flour incorporated. the batter will be very thick. Fold in the blueberries. Because the batter is so thick, this may take a few minutes. Spread into a greased 9-in. square baking pan. 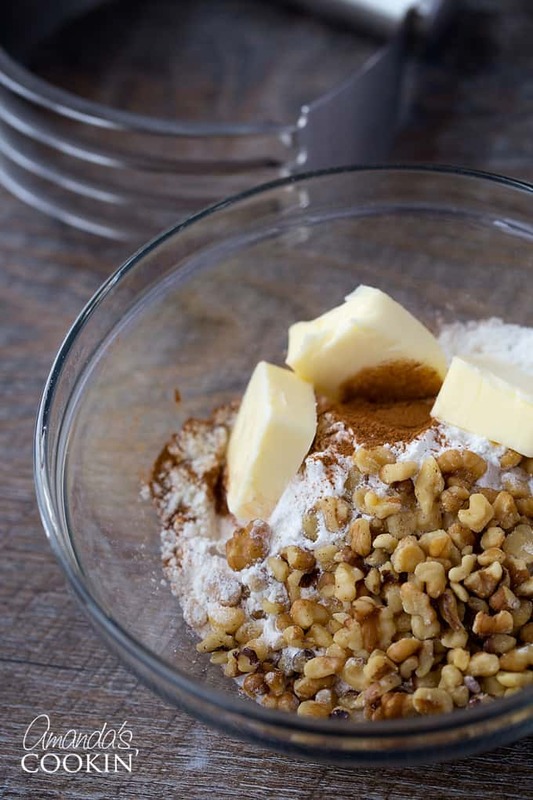 For topping, combine sugar, flour, walnuts and cinnamon in a mini food processor or bowl. Add butter and process, or cut in if doing by hand, until mixture is crumbly. I like to do this with my fingers so I can tell when it’s ready by touch. Sprinkle over batter. Bake at 350 degrees F for 40-45 minutes or until cake tests done. 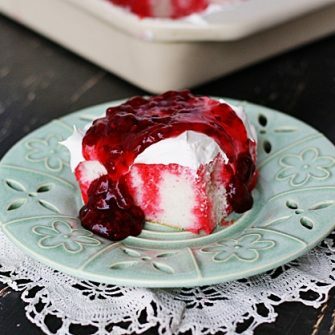 Note: I made mine the night before, covered it with foil and we enjoyed it the next morning, but this would make a great snack cake or dessert cake as well. Perfect! I hope you all enjoy this absolutely satisfying blueberry breakfast cake! Do you love blueberries as much as I do? 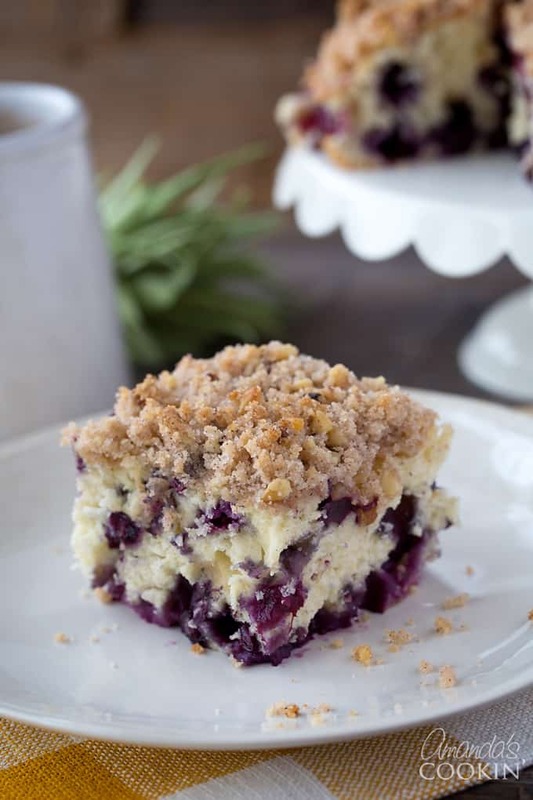 If so, you may want to check out this One-Pan, No-Bake Blueberry Cheesecake, YUM! 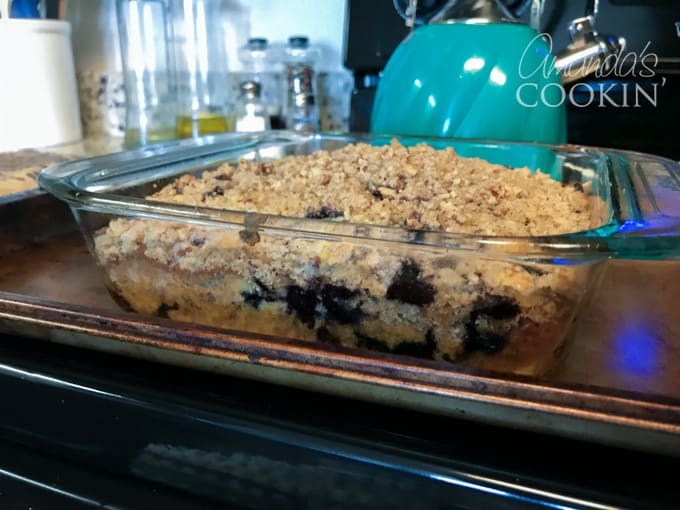 If you want something a little more “grab-n-go” try these Blueberry Breakfast Bars from All Day I Dream About Food. Or how about this to die for Blueberry Cobbler, bursting at the seams with fresh blueberries! Blueberry fans will swoon over this decadent Blueberry Lush dessert! Or for other amazing fruity breakfast delights check out this Cranberry Streusel Coffee Cake, and last but certainly not least this delicious Raspberry Coffee Cake. Enjoy! 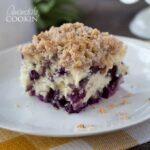 Breakfast cake, coffee cake, blueberry buckle, whatever you want to call it, it’s overflowing with blueberries and absolutely delicious. In a large bowl, whisk together flour, sugar and baking powder. Cut butter into small pieces. 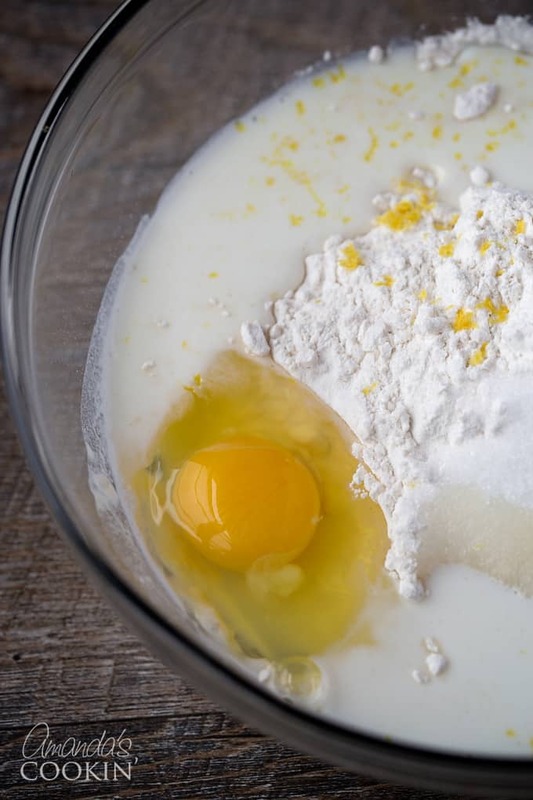 Add egg, milk, butter and lemon peel; mix just until dry ingredients are moistened. You may need to finish mixing with your hands to get all the flour incorporated. the batter will be very thick. For topping, combine sugar, flour, walnuts and cinnamon in a mini food processor or bowl. Add butter and process, or cut in if doing by hand, until mixture is crumbly. I like to do this with my fingers so I can tell when it's ready by touch. Sprinkle over batter. Bake at 350 degrees F for 40-45 minutes or until cake tests done. For drizzle, combine the powdered sugar and milk. If too thick, add a few drops of additional milk at a time until it reaches drizzling consistency. Drizzles over the top of the cake and allow to sit until sugar solidifies. This cake has a very thick batter that will have to be spread into the pan rather than poured. It's also very important to make sure you are measuring your flour properly so that you don't end up with more than you are supposed to. 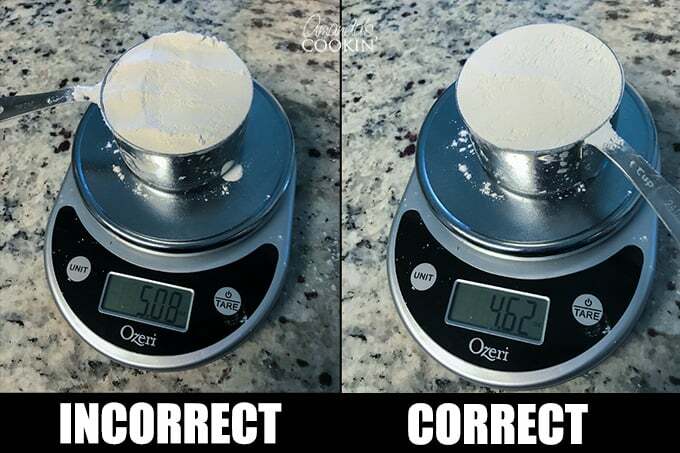 Always measure flour using the "scoop and sweep" method. This post was originally published on this blog on Jul 23, 2010. HI Amanda, did you use whole milk and would almond milk work in the same measure? Hi Patricia! I likely used 1% milk in this recipe as that’s what I usually have in my kitchen. Whole milk would work fie. I do not know for sure if almond milk would work simply because I haven’t tried it. If you decide to try I would love to hear how it works out! So, do beautiful and I can’t resist a crumb topping. Love this for Spring/Summer, pinned! 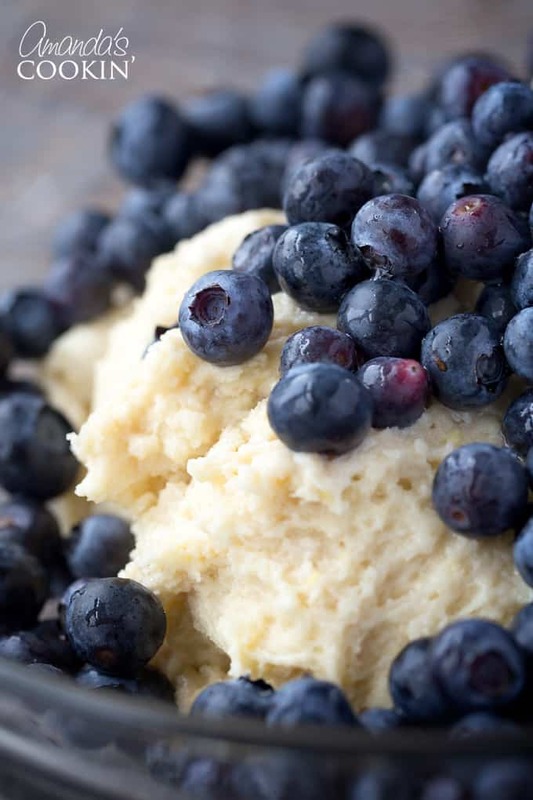 Do you have to thaw the frozen blueberries (or cherries) before adding to the batter? Can I double this recipe? I have 6 kiddos! Was going to use a 9×13 pan. Am I safe?! Hi Hannah. First I need to state that I have NOT tried doing that. But I feel like that would work, doubling the recipe in a 13×9. If you try it, I would love to hear your results! Can you make this the night before and leave it in the fridge and bake it in the morning? Could you double the recipe and bake it in a 9X13 pan? I want to take this in to work to share with my co-workers. Otherwise, if not, do you have adjusted measurements to make a larger quantity? Seems like this recipe is so good a 9 inch pan isn’t big enough to keep leftovers for longer than a day. Hi Stephanie! A 13×9 pan would not be big enough to double the recipe. I would recommend making two 9×9 pans instead. To adjust the measurement, go to the printable recipe card at the bottom of the post, then hover your mouse over the number of servings. A slider will appear allowing you to change the number of servings :) To make a 13×9, change the servings to 24 instead of 16. Thank you! Enjoyed this. I changed the topping a bit in the absence of nuts. I used oats, brown sugar n a couple tablespoons of flax seed n chia seeds each. And added a lil lemon juice n zest to the drizzle glaze. This is a great recipe! But it needs salt, both in the cake and the topping, especially since I use insalted butter or margarine. I added a scant teaspoon of salt to the cake, and a half tsp to the topping. That punched up all the other flavours. Came out amazing. I didn’t have walnuts so I used pecans, and I didn’t have any lemon so I omitted that. Otherwise followed the recipe exactly. It’s just my fiancé, our two year old and I and it was gone by 1pm! Really great recipe and So So easy! Hi Sarah. Yes it should be fine if you wrap it tightly with aluminum foil or plastic freezer wrap, or place in heavy-duty freezer bag. Should keep for 2-3 months. So we tried making it and it turned out completely blue from the blueberries…not sure what we did wrong. I tried this morning and it was AMAZING!!! Thank you so much! So glad you liked it as much as we do Carol, thank you! I have a bunch of fresh frozen blackberries left from last summer. I don’t know what to do with them except make blackberry cobbler. Would they work for this? Since they’re more tart than blueberries, should I add more sugar? Ahhh! I thought today was Thursday and made this for my Moms group but then while it was baking I realized it is only Wednesday!! Would you recommend reheating it tomorrow or serving cold? If I should reheat, how do you think I should do it? I don’t want to over cook it! Help!!! I took a test bite and it was deeeeeeelicious! This cake is currently baking in the oven because my pregnant self was craving coffee cake at 9pm at night and the kitchen smells amazing. I had to substitute brown sugar for the white because my husband used all the sugar without telling me. I think it will just give it a richer flavor from the molasses in the sugar. Thanks for the recipe!! Yes the brown sugar should be fine, I hope you enjoyed it! We added a little bit of brown sugar to the topping and added 1/4 cup of milk to the batter because it was to dry . This yummy treat was a huge hit in our house:) Thank you for sharing. My 10 year old son made this recipe , he wants to be a chef someday. So fun! I’ll be he’ll be a great chef! Definitely needs 1/4 cup more of milk to make the batter look like your pictures. Otherwise it was pliable like pie dough. Love this recipe! I do have to double the recipe to feed my family of 6. Made it once before and had my husband’s coworker want to buy a whole pan!! For breakfast today I left out the nuts and added ginger for a kick of flavor! Can I use frozen blueberries instead? If so, any tips with baking it? yes, just leave them in the freezer until you get to the step to add them. can half & half be used instead of milk? Half and half has a higher fat content than milk which could affect the recipe. I would recommend using milk if possible. Hi Amanda— I have made this recipe several times, but this time I plan on using cranberries to make it more seasonal, so I’ll be adding cinnamon and nutmeg like you suggested. How much of both spices do you think I should add to the mixture? I used cake flour ,did not have enough all purpose flour. Hope it will turn out.and used butter milk. Cake flour could change things unless you made the necessary adjustments. How did it turn out? 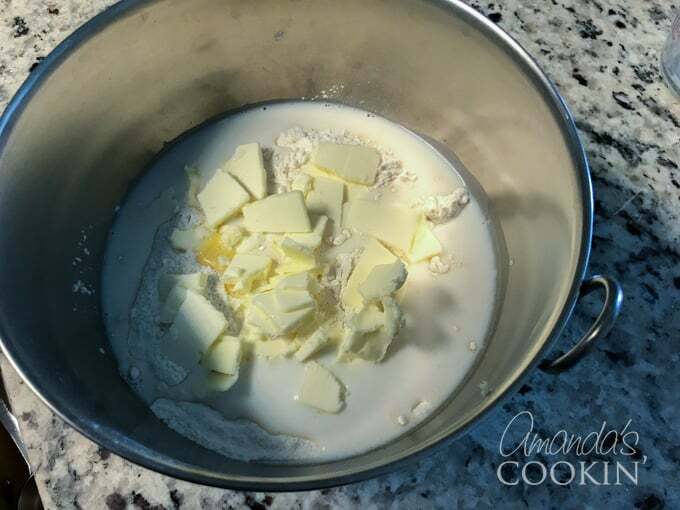 Question – is the butter getting cut into the flour and then liquid added? I can’t imagine softened butter being ‘cut into small pieces’. Rather I’m reading this recipe (and am a seasoned homebaker) that the butter is so soft that is just incorporates well…so that to me is really soft not-cuttable butter. Thanks for the assist! Softened butter – I think this is a common issue in the kitchen. Softened butter simply means it’s not rock hard from the refrigerator and should be soft enough for your finger to cause a slight indent. Your finger should NOT sink into the butter, that’s too soft. When butter gets too soft, or worse is actually melted, it changes the chemical reaction that takes place when mixed with other ingredients. My suggestion is to remove the butter from the fridge first, then measure out all of your other ingredients, preheat the oven and grease your pan. When you get to the step of adding the butter, cut it into small pieces and mix it in. Use your hands if you need to. I doubled the recipe and put it in a13x9 cake pan. Making a bigger version to take into my office. It took an extra 15 minutes to bake. I also removed the nuts from the topping (for nut allergies) and added a pinch of nutmeg. It smells/looks amazing! I can’t wait to try a piece tomorrow!! Thanks for sharing, Amanda! Sounds delicious :) Hope it goes over well! I would like to make this to give to a friend without having to have the pan returned. Can the same ingredient measurements be used for a 8.5 inch disposable round pan? Would I need to alter the cooking time? I don’t see why not. The size is very similar to the square pan so I don’t think you would need to adjust anything. This is amazing! I made it today for dessert , I don’t like sweets for breakfast so I thought this would be fitting to have after dinner . It was the perfect thing. Thank you for sharing. So glad you loved it Felicia! Hi Jill. Buttermilk is different than regular milk, so if using buttermilk for this recipe you would need to reduce the baking powder by 1 teaspoon and add 1/2 teaspoon of baking soda. I would love to try this but I need to make it nut free. Any suggestions for substitutions of the nuts called for in the topping? Thanks. Hi! Can this be doubled and baked in a 9×13? Did you try doubling the recipe? I would like to do the same. Just made this morning! My entire house smelled amazing and it is so delicious with freshly picked blueberries. Without making it again I’m afraid I don’t know the final weight. I’m so sorry! This looks so yummy! Would it be ok if I were to use raspberrys instead of blueberries? Thanks! Hi, Sarah. Though I’ve never tried gluten-free flour, I believe it would be okay. If you try it, please be sure to let us know how it goes! This recipe looks delicious and I can’t wait to try it! I was wondering if it can be made a day in advance and still taste just as yummy? Thanks! Followed the directions to the T and it definitely was not a moist cake. Sorry to hear, Amy. Sometimes ovens bake differently and at different temperatures than what’s being read. Best of luck to you next time. 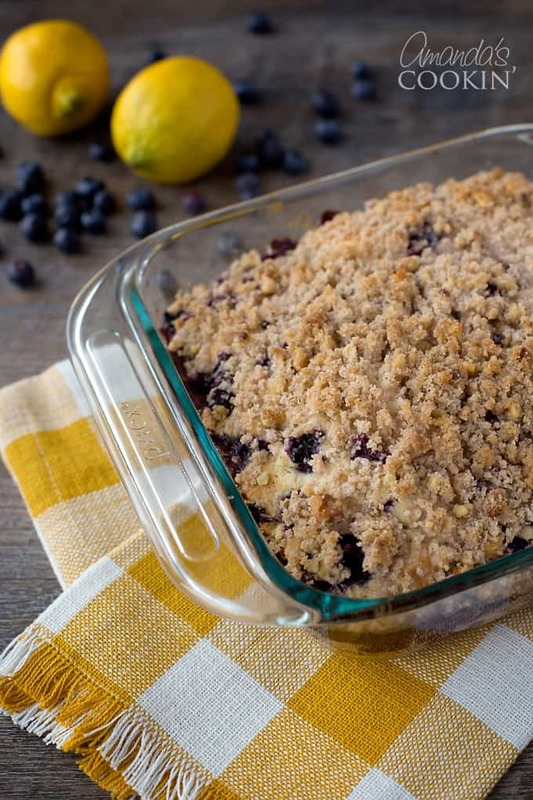 I was just wondering if I could make blueberry coffee cake and then freeze it! Would it be good ? Just finished making this it turned out great! I used buttermilk because I had it about 3/4 cup instead of regular milk. I am going to try freezing it this weekend, but of course I had to sample it! This sounds so great! was wondering if the topping uses brown or white sugar? Just tried this cake today and it went amazing!! I actually used GF flour (for my mom because she has celiac disease) and almond milk because it was all we had on hand – 1/2 cup definitely wasn’t enough because my batter wasn’t just thick it was dough like (note that almond milk typically does this anyways I’m used to it) so I just kept pouring until I got to a thick batter. My mom loves it so thank you!!! Amanda, I just made this Blueberry cake for breakfast and it came out a bit dry. I followed the recipe like you have it on here. I’m not sure what I did wrong, Although it was tasty. Thanks for sharing this recipe. I altered a little to make a bit healthier. My grandsons and I made it just now. Can’t wait to try it. I made this yesterday. Followed the recipe to the letter. When combining the wet and dry ingredients the flour soaked up all the wet and there was still flour in the bowl. I added just under a 1/2 cup of milk. Turned out beautiful and delicious! how do I get into my saved recipes box? I made these this morning…amazing! I love lemon so instead of adding the 2 tablespoons of milk to the glaze, I substituted for 2 tablespoons of squeezed lemon juice. The glaze was phenomenal and the cake terrific. We made this cake and it was TERRIBLE… a waste of ingredients, time & very frustrating. The dough was too thick, it never rose, and tasted like not properly cooked dough. Is there an ingredient missing? Sorry yours didn’t turn out Maria. All the ingredients are there and there are several commenters that made it successfully. I’m not sure what could have went wrong with yours. Is it possible you missed an ingredient or accidentally mismeasured somethin? Did you substitute any of the ingredients? Eeek. This is how mine is turning out. I reviewed the ingredients 5 times making sure I added enough wet. It’s in the oven now. I hope it turns out, I have guests coming for breakfast! Hi Brooke, how did yours end up coming out? The batter is very thick, thicker than most people expect it to be. Hope it turned out! What size pan do you use? I must be overlooking something. Thanks! Oh, how delicious! It would be just perfect with this lovely cup of tea I just brewed. 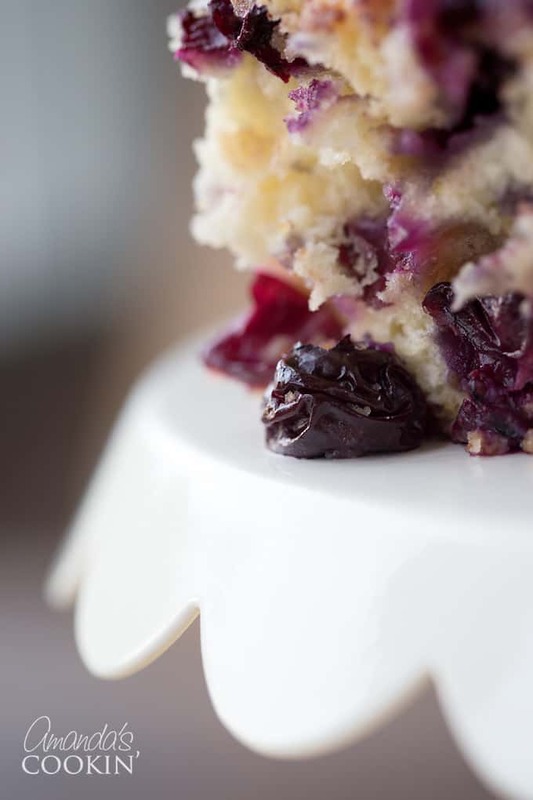 And thanks a million for including a link to my blueberry lemon muffins. I love blueberries! Looks fab! I made this for my mom's group this morning, and it was DEVOURED!! SO yummy! I will def be making this again. I only had skim milk, so I used that and half and half. I used frozen berries right out of the freezer, and I baked it in a stone pan, so it only took about 25 min to bake. This looks terrific. I'm making it now. Out of milk, so I'll use 1/2 n 1/2, and almonds instead of walnuts. (That's what we do, use the pantry.) I'll let you know how it comes out. I can hardly wait. So happy to hear that Shelley! Maybe I should make it again :) YUM! I wish I was eating this right now! Yum! Wow, Amanda, this really does look amazing. I'm sure it would be delicious with a good strong cup of coffee. Yum! Oh does this look great! Reminds me of Bojangles BoBerry Biscuit! This looks amazing Amanda! Yum. oh wow, this looks so good. I love all your photos of food! Looks so tasty and yummy! The added drizzle looks fantastic and sounds delish. Oooooh I like this. SU'd! I love coffeecakes like this, especially with a drizzle on top. You always know how to hit my sweet spot with your baking. I'd be perfectly happy to have this delicious looking cake for dessert too. This would certainly get anyone out of bed in the morning! It sounds delicious and looks divine! You sure love your drizzles don't you? This looks great!! Yummy!! I like cake for breakfast :D this is going on my to-do list for sure! I don't think I've ever seen a recipe here that I didn't think was just wonderful. I love coffee cakes and this one looks delicious! Esto realmente se ve divino, que delicia de bizcocho.